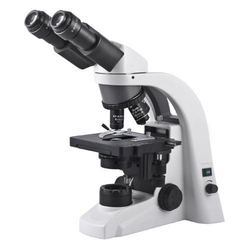 With a firm commitment to quality, we are involved in offering a wide ambit of Laboratory Microscope. Viewing Head: Trinocular Observation head conveniently inclined at 45 . Focusing: Co – axial coarse & fine focusing module with slides travelling on ball bearing guide ways. Under the expert guidance of our technicians we present a wide array of different products to our customers.The range we deal in provides accurate results and has good repeatability and is used in host of applications.These are easy to operate and maintain. We offer Image Acquistion System using CMOS/CCD Camera. Interactive image acquistion, analysis and archiving also possible. We are into manufacturing and supplying a quality tested range of Laboratory Microscope. 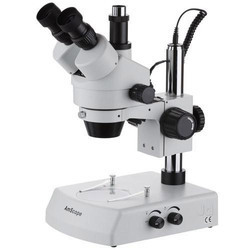 These microscopes are manufactured keeping in mind the requirements of the customers. Our team members make use of high-grade raw material to manufacture these microscopes in tandem with set industry standards. - Stand: Sturdy and Durable pressure Die cast Aluminum stand. - Mechanical Stage: Co-Axial low drive double plate mechanism system travel on ball bearing guide ways. All items for Biology lab in school are available. Used in microstructural analysis of differents metal samples.Availabels in differents magnifications, 50X..2000X.Availabels in different objectives and eyepieces conbinations.